As part of the event’s Social Impact Zone, we had the opportunity to speak with more than 400 attendees, who visited our area and discovered how we’re tackling some of the world’s most pressing challenges. They answered the GPS Question of the Day on our virtual graffiti wall, listened to pitches from teams of GPS Challengers, and made their own positive impact by building pi-top computers and hygiene kits for donation. Attendees and social media followers had the chance to vote for one of three entrepreneurial teams, with the top vote-getter receiving a US$25,000 prize at the end of the week. Those on-site visited the Social Impact Zone and met each of the teams, learning more about their innovations and aspirations to solve a global problem before voting through the event’s mobile application or via social media. Neopenda, a medical device startup for neonatal technology solutions, dot Learn, a software compression startup making online education more accessible and affordable, and Liberty Mechatronics, who are using technology to make oil filtration more efficient, all presented live demos to curious attendees in the Social Impact Zone. At the end of the week, more than 750 attendees voted, and dot Learn took home the US$25,000 grand prize! All throughout the week, we asked attendees how they’d be global problem solvers by using technology more intuitively. From Monday to Thursday, we posted a different Question of the Day, either on our virtual reality graffiti wall or through daily Facebook polls, to spark creativity in those following Cisco Live. Attendees who submitted compelling answers and voted for a GPS Challenger during the week took home an Oculus Rift headset on Monday, Tuesday, or Wednesday. By the end of the event, our followers cast more than 18,000 votes for the unique questions of the day! Cisco Corporate Affairs Senior Vice President Tae Yoo sat down with Lauren Woodman, CEO, NetHope and Sue-Lynn Hinson, Manager of the Cisco Tactical Operations team. They discussed the critical role that technology plays in disaster and humanitarian response in front of a crowd of 60 attendees while touching on the challenges and risks these new opportunities present, as well as how companies like Cisco can leverage technology to improve relief efforts. Attendees built modular laptops powered by the Raspberry Pi in our Social Impact Zone, either on Monday or Tuesday as part of Cisco Live’s give-back activities. At the end of the week, we donated 500 pi-tops to local Cisco Networking Academy students, providing a transformative learning experience and empowering students to become collaborative, critical, and creative thinkers. In partnership with Clean the World, Cisco Live attendees assembled more than 12,000 hygiene kits that include soap, shampoo, and other items that were donated to the local community in Orlando. Through Valencia College in Orlando, Cisco Live awarded two Cisco Networking Academy scholarships to Richardson Jacques and Luis Franco. The Cisco Networking Academy Dream Team of 10 students worked side-by-side with Cisco engineers to install more than 880 access points across the 2-million square foot convention center in Orlando. Cisco CEO Chuck Robbins shared an update on our goal to positively impact 1 billion people by 2025 during his opening keynote, and Cisco CSR was featured in four separate live broadcasts during the week. 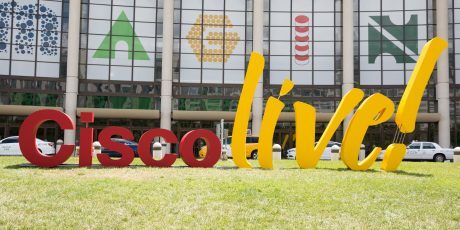 Be sure to follow Cisco CSR on Twitter for even more updates from Cisco Live and beyond.